Tom Hazard has just moved back to London, his old home, to settle down and become a high school history teacher. And on his first day at school, he meets a captivating French teacher at his school who seems fascinated by him. But Tom has a dangerous secret. He may look like an ordinary 41-year-old, but owing to a rare condition, he's been alive for centuries. Tom has lived history--performing with Shakespeare, exploring the high seas with Captain Cook, and sharing cocktails with Fitzgerald. Now, he just wants an ordinary life. Unfortunately for Tom, the Albatross Society, the secretive group which protects people like Tom, has one rule: Never fall in love. As painful memories of his past and the erratic behavior of the Society's watchful leader threaten to derail his new life and romance, the one thing he can't have just happens to be the one thing that might save him. Tom will have to decide once and for all whether to remain stuck in the past, or finally begin living in the present. 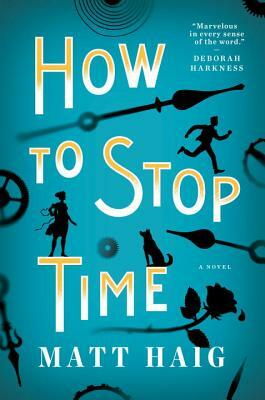 How to Stop Time tells a love story across the ages—and for the ages—about a man lost in time, the woman who could save him, and the lifetimes it can take to learn how to live. It is a bighearted, wildly original novel about losing and finding yourself, the inevitability of change, and how with enough time to learn, we just might find happiness. Soon to be a major motion picture starring Benedict Cumberbatch. Matt Haig is the author of the internationally bestselling memoir Reasons to Stay Alive, along with five novels, including The Humans and The Radleys, and several award-winning children's books. His work has been translated into more than thirty languages. "Matt Haig uses words like a tin-opener. We are the tin." —Jeanette Winterson, author of Why Be Happy When You Could Be Normal? "A story you’ve been longing to read . . . Haig’s proficiency in writing for children has lent a gentleness that cuts to the very heart of this work and its readers." —Evening Standard, "The Best Books to Read This Summer"